They say that ‘every cloud has a silver lining’. And that is true of every recession. For those lucky or prudent enough to have weathered the economic down turn there are no end of bargains to be had. This is especially true for anyone looking for a wooden boat. 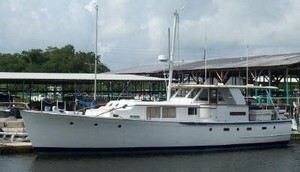 Take for example this Classic Mahogany hulled 53foot Motor Yacht which Henrik in the US is bidding for. There is a good chance that anyone buying a wooden boat now, then doing a little work on her could double their money in a few years when the economy recovers. But aside from any speculative considerations there are many wooden boats like Henrik’s which deserve to be preserved, not just for their beauty but as cultural artefacts with historical significance. Please use the form below to share your story..